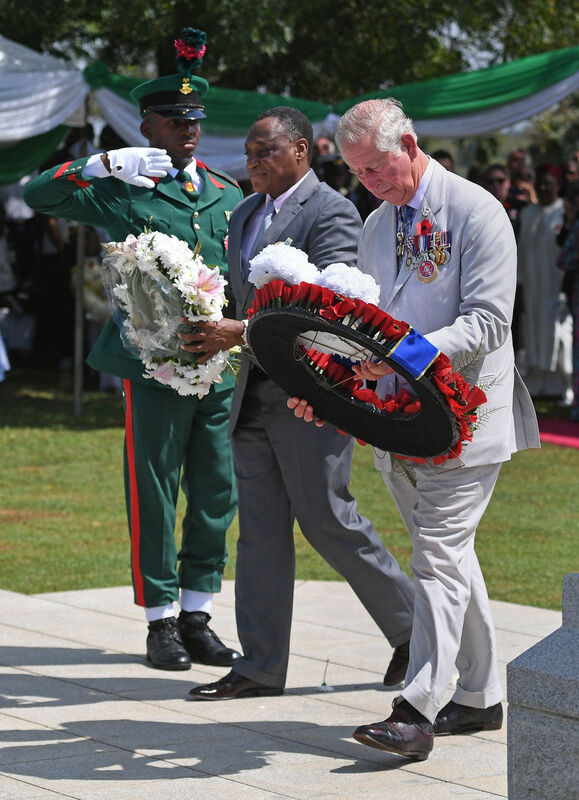 On Thursday 8th November, final day of the Royal visit to Nigeria, The Prince of Wales visited the Commonwealth War Graves Commission Memorial in Abuja. His Royal Highness laid a wreath at the memorial and an Imam and a Chaplain from the Nigerian Guards Brigade recited an Islamic and then a Christian prayer. The Prince of Wales then attended a Rural Livelihoods Engagement and joined a discussion on the challenges of poultry rearing in Nigeria and the production of a cereal crop, Fonio, locally known as Acha. The Prince discussed also discussed WaterAid programmes with ChiChi Okoye, Country Director of WaterAid and her staff. The Prince of Wales has been President of WaterAid since 1991. 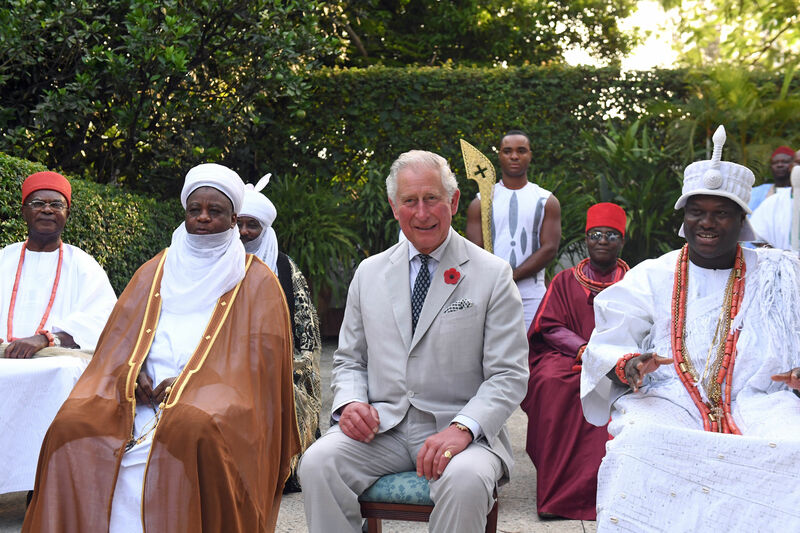 Finally, to end the visit to Nigeria and the Royal tour to West Africa, The Prince of Wales joined a Peacebuilding and Interfaith Engagement, chaired by The Deputy High Commissioner, Harriet Thompson. During the engagement, His Royal Highness heard stories and experiences from youth peace ambassadors. A Youth Peace Camp is held 4 times a year bringing together 600 youths of diverse religious and ethnic backgrounds. 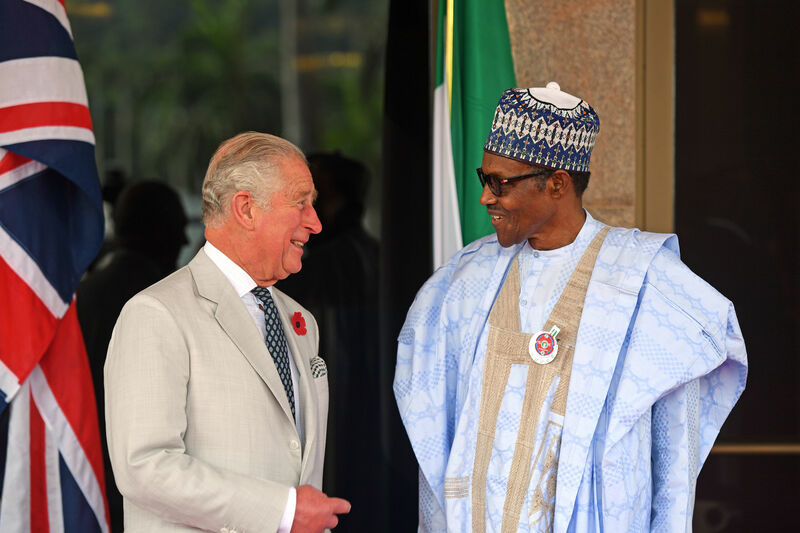 Today The Prince of Wales travelled to Lagos in Nigeria as he continued the Royal Tour of West Africa. 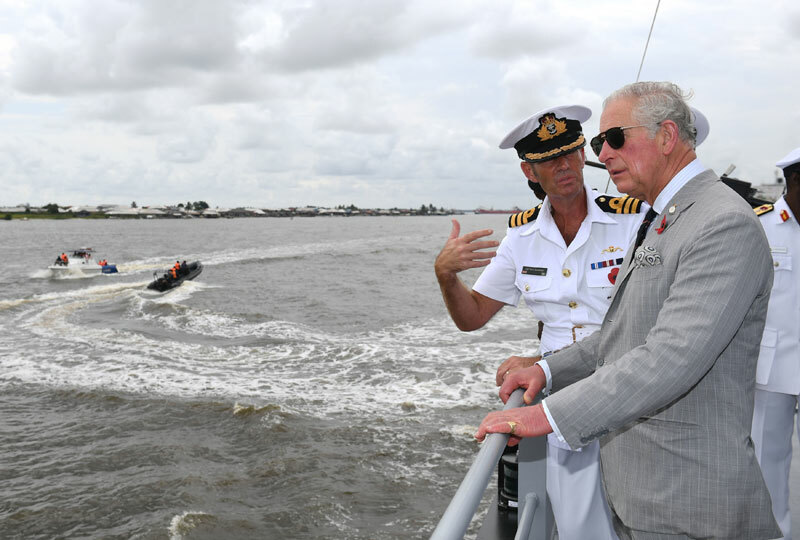 The Prince began the day at Lagos Naval Berths and was met on arrival by the commanding officer, Andrew Zidon, who trained at the Britannia Royal Naval College from 2002 to 2003. The Prince of Wales then attended an Accounting for Sustainability Roundtable and joined a discussion on how business can improve sustainability within their organisations and how challenges may be overcome. Next, His Royal Highness met young entrepreneurs from the worlds of digital, music, film, fashion and social entrepreneurship at the British Council Festival before attending a reception for The Prince’s Trust International. 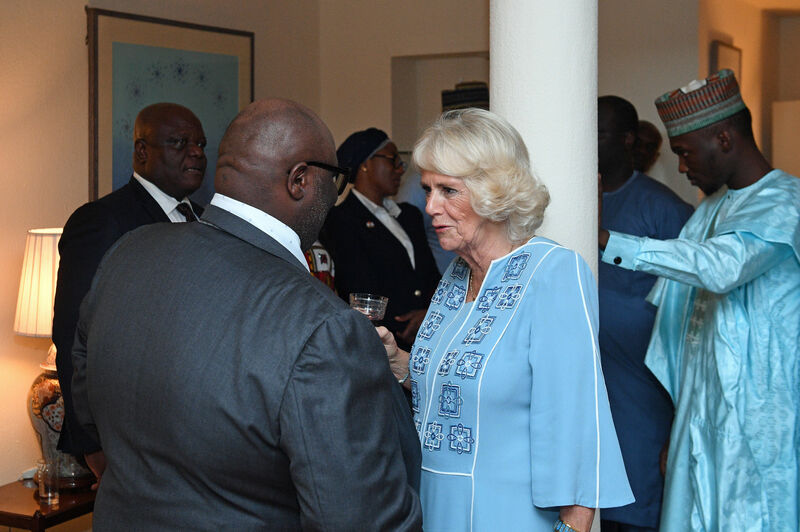 In the evening, The Prince of Wales attended a Reception at the Deputy High Commissioner’s Residence, where he met members of Nigeria Commonwealth Walkway Committee and a number of Nigerian fashion designers. 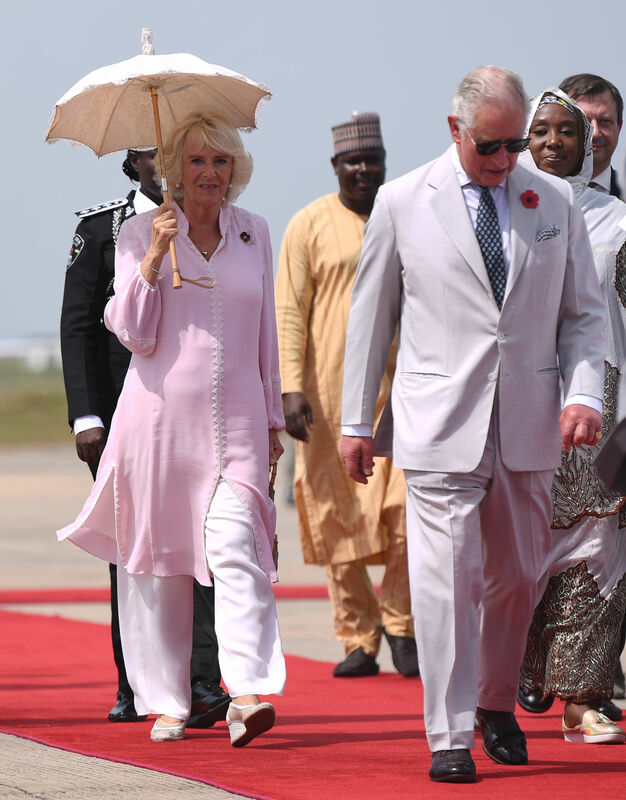 Today The Prince of Wales and The Duchess of Cornwall arrived in Nigeria for a three-day visit that will conclude Their Royal Highnesses’s tour of West Africa. After being greeted on arrival by The British High Commissioner, Paul Arkwright C.M.G. and The Nigerian Foreign Minister, The Hon. Mr. Geoffrey Onyeama, The Prince and The Duchess travelled to the Presidential Villa in Abuja where The President of Nigeria, H.E. Muhammadu Buhari, welcomed them to the country. 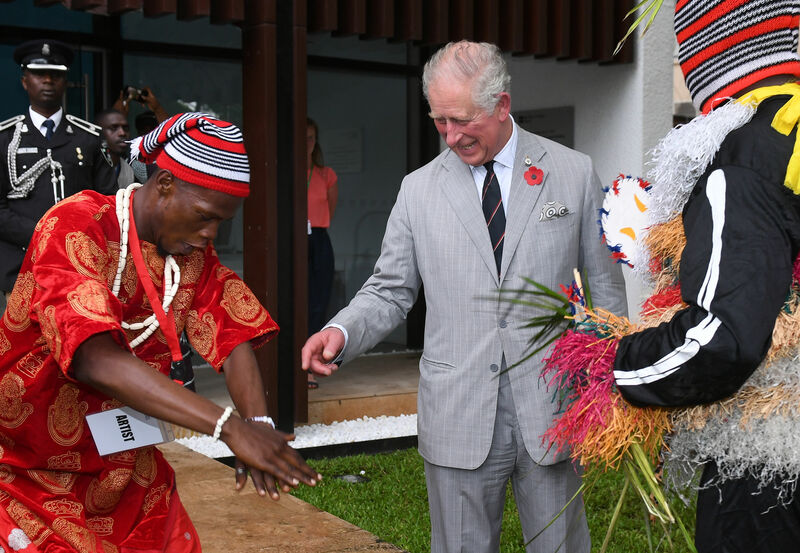 After a private meeting with The President, The Prince of Wales attended a meeting with Traditional Rulers at the British High Commissioner's Residence. Nigeria’s traditional rulers have their origins in the independent states and kingdoms that existed in Nigeria before the colonial period and The Prince met the most senior rulers from across Nigeria’s six geo-political zones. Meanwhile The Duchess of Cornwall met children taking part in a literary workshop at the Salamander Café. The workshop was the first in a series of events to encourage children to participate in The Queen's Commonwealth Essay Competition. Nigerian and British authors who are part of Abuja Literary Society were also at today’s literary workshop, and read out some of their work to The Duchess and guests. The Society is a highly regarded group comprising many well-known literary minds, including published authors like Chinere Obo Obasi, Denja Abdullahi, Theresa Ameh as well as amateur and budding writers. The Duchess of Cornwall then joined a discussion of ideas for a future Women of the World Festival (WOW) which is to be held in Nigeria. In the evening, Their Royal Highnesses attended a reception at the British High Commissioner’s Residence. Everyone is our neighbour, no matter what race, creed or colour. Separation at this time is especially hard to bear. Nigeria has much to be proud of. Twice within the span of a single generation, Australia and Britain stood side by side in two of the bloodiest wars in human history. Over the two World Wars and in the many conflicts since then, women in Britain and throughout the Commonwealth have faced and overcome all manner of challenges. Wherever the future may take us, my admiration and affection for Canada and Canadians everywhere is - and will always remain - clear, strong and sure. I am happy to be in Hamilton today in order to present new Colours and to visit my Canadian Argylls. Je chéris ma place dans la vie du Canada et mon lien avec tous les Canadiens et Canadiennes. I am proud to be the first member of the Canadian Royal Family to be greeted in Canada's newest territory. It is my pleasure in this my Golden Jubilee Year to declare the 17th Commonwealth Games open. I am glad to be in Merseyside, which must be one of the most distinctive and energetic parts of the United Kingdom. We have both been struck by both the diversity as well as the dynamism of Australia, and the vigour and humour of Australians everywhere. It is our very diversity which makes the Commonwealth strong. Whatever may lie ahead, I declare again here tonight that my admiration, affection and regard for the people of Australia will remain, as it has been over these past fifty years, constant, sure and true. New Zealand is working to improve and strengthen all the various relationships between Maori and the Crown. The Commonwealth remains one of the strongest pillars for the building of world-wide peace, growth and development. For Christmas marks a moment to pause, to reflect and believe in the possibilities of rebirth and renewal. By any measure this Millennium year has been an unforgettable one. This December we are looking back not just on one year, but on a hundred years and a thousand years. Though we each lead different lives, the experience of growing older, and the joys and emotions which it brings, are familiar to us all. I remember my own childhood Christmases here, with my father and mother, and a great family gathering, and now I delight in seeing my children and grandchildren enjoying the same traditions. But I cannot think of any Christmas of my reign when the message of the angels has been more apt. To see British and Russian veterans standing together, in memory of the sacrifices of their comrades-in-arms, was a moving experience. We have indeed become a global village. I first came here for Christmas as a grandchild. Nowadays, my grandchildren come here for the same family festival. I am constantly amazed by the generosity of donors and subscribers, great and small, who give so willingly and often towards the enjoyment of others. I hope that all of us lucky enough to be able to enjoy such gatherings this Christmas will take time to count our blessings. Unlike all the other planets in the solar system, earth shimmers green and blue in the sunlight and looks a very pleasant place to live. May the Christmas story encourage you, for it is a message of hope every year, not for a few, but for all. I hope we will all help each other to have a happy Christmas and, when the New Year comes, resolve to work for tolerance and understanding between all people. There are many serious and threatening problems in this country and in the world but they will never be solved until there is peace in our homes and love in our hearts. These success stories are often pushed into the background but they are the guarantee of our future. But friendship, whether we are talking of continents or next door neighbours, should not need strife as its forerunner. I hope that Christmas will remind us all that it is not how we communicate but what we communicate with each other that really matters. Throughout history, seamen all over the world have shared a common experience and there is a special sense of brotherhood between merchant and naval seamen, fishermen, lifeboatmen and, more recently, yachtsmen. All around us we see these acts of selflessness, people putting the life of someone else before their own. I come across examples of unselfish service in all walks of life and in many unexpected places. Today we celebrate the birth of the child who transformed history and gave us a great faith. My grandfather, King George V, started the tradition of the Christmas Day Broadcasts back in 1932. Remember that good spreads outwards and every little does help. I believe that Christmas should remind us that the qualities of the human spirit are more important than material gain. The Christmas message is really one for all seasons and not just for one day of the year. Never before has there been a group of independent nations linked in this way by their common history and continuing affection.